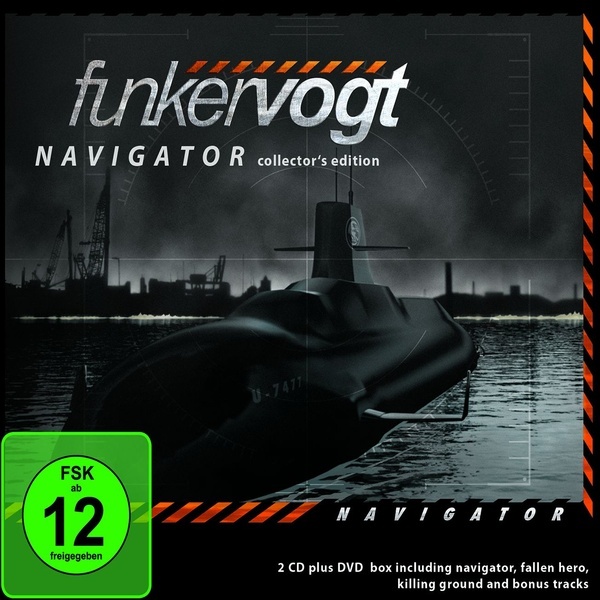 Navigator is one of the most important releases of the cult band Funker Vogt, and finally it is available again on CD. This beautiful Collector's Edition comes in a 2CD+1DVD disc digipak, containing the following releases: - Navigator, Fallen Hero, Killing Ground plus various bonus material, rare and unreleased tracks - DVD containing the complete historic show “Funker Vogt live at the Kinetik Festival 2008 in Montreal, Canada”, video-clip “Fallen Hero” and special 2 ‘making-of’ clips. Completed by a detailed booklet with all original artworks and for the first time including all lyrics. Altogether 27 tracks plus 4 videos! Especially for new and younger fans of Funker Vogt this is a good chance to complete their collection. Here they will find the classic club-hits like „Fallen Hero“, „Killing Ground“ and „Vorwärts!“ which are still present in the current playlists of the DJs and which are still played live at Funker Vogt concerts. The listener will get a view behind the scenes and can discover the evolution of a song from the very first demo-edit (Vorwärts!) towards the final version. Tracklisting CD2: "Fallen Hero" & "Killing Ground"